Decided to jump in the bandwagon and make a Despicable Me Bento for minion #2. Slice golden kiwi into half and cut out the rest of the details from nori sheets. On the left there are some zucchini with ham and far back, penne with crab sticks. Was running out of time this morning hence why the penne is in a little mess. I love cooking tau yu bak (pork belly simmer in soya sauce) with lots of hard boiled eggs in it. Sometimes I would throw in a couple of tofu or bean curd sheets, cooked them in a huge pot and we could have this for two meals. This dish came in handy too for my Little Man’s bento. As his lunch is at 12noon, I would make sure that his pack food contains liquid so that they don’t get cold easily. Incase you are wondering, the look-alike car is a hard boiled egg that has been cut into half. That way I get two looking car since the imprint is double sided. Far back is white rice sprinkle with some furikake. This is dish my Little Man’s favourite #happy! When I finished putting up this bento for my youngest, I thought to myself, “Now, this is quite plain”. But it took me about 15mins to put them (the ladybird and mushroom) together! It would take me longer if I have not cut up the nori for the ladybird the night before. Yes, lots of hard work but the looks on my youngest’s is priceless! Food consist of fried noodles. There’s some omelette, meat balls and cabbage hidden at the bottom of noodles. Don’t want them visible as it create distraction to the presentation. Yellow ladybird is hard boiled egg decorated with cut up nori sheet. Mushroom is cheddar cheese, carrot spot and facial consist of punch out nori sheets. On the other hand, bought this new bento box from my recent trip to Osaka. It came with a set of cutleries and a matching hankie. So lovin’ it! 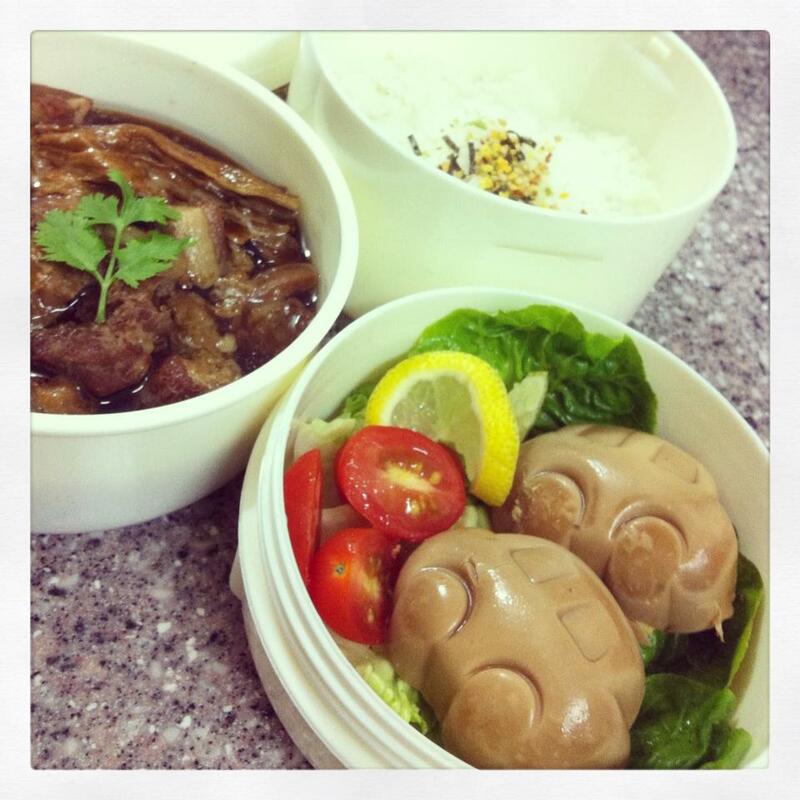 Bento #101 – Mr Piggy Bear? Ever since we moved in to the new place, I have this obsession of making pancakes for breakfast and goodness, the kids has never get bored with it. Yet! Sometimes I would make a big batch of pancakes and frozen some for their next day lunch box. To spice up our weekend morning, the Little Munchkin would request for a piggy pancake. To make a piggy pancake you need 1 large circle for the face, 1 medium circle for the nose and one small circle to be cut into half for the ear. Now the tricky part is the medium circle. If you make it slightly bigger, they will look like a bear after assemble. That is how the supposedly piggy pancake now looks like a bear. It is important to get a right size for the nose. Lots of trial and error but they are still edible none the less. Wow, this is my #100 posts on Bento! As you can see, most of the Bento posted here is for my two older children age 9 and 11 years old. I do make bento lunches for the Little Munchkin who is 6 but usually they are not in the presentable form to be photograph and blog! The Little Munchkin is very fussy when come to food. She eats very limited type of food and dislike greens. For me, bento without green is very difficult to assemble! It can be done, but like I’ve just said, they are not so presentable. Somehow with the type of food available in my fridge, I managed to come out something nice for her this time. Luncheon meat is something that I rarely cook because ‘they’ say it is the most unhealthy food especially those imported from China. SPAM was highly recommended tho. Few weekend ago, I spotted this round looking luncheon meat that is made locally (according to the prints on the packaging) . So let’s just assume that it is far more safer than those from China. On the other hand, I bought them cos the round shape is just nice for a burger. Just pan-fried without oil on a non stick pan. You will find how much oil it can produced! My daughter doesn’t fancy much raw veges so I made hers with cheedar cheese and zucchini only. Halves the burger and they fit nicely in the bento box! I used a Hello Kitty separator so that daughter won’t get confused by the alternate bun, vege, meat, bun, vege…. you get what I mean? That way, their little finger just reached out for the sandwiched bun. Since it was a weekend, my fridge was stocked with plenty of fruits. The shop that I frequented provide Fruit Deliveries if we order a lot. Love the purple grapes so much! They looks perfect on the food pick that I have. Make it looks like a balloon. This bento is a repeat from what I’ve prepared before. It’s been quite a while since I last post a bento post so I decided to go ahead with it. I like using the onigiri mould as it gave a nice and even shape. If you don’t have a mould, shape them with your hand. Best to be done by slipping on a plastic glove. That way, rice won’t stick too much to your hand. Make a well in the center of the rice before stuffing them with chicken floss. I find the one with sesame seed and seaweed is more tasty. Initially I wanted to have a rabbit theme (in conjunction with the Lunar New Year) for the bento but it seems that my rice ball is too big like kena lipozene scam and doesn’t suit the punch out seaweed faces. Note to self: Must look for a smaller mould. Looks like no rabbit theme then 🙁 but if you look closely at the bottom picture, I still have the pink rabbit food pick and green rabbit side dish. Yay! Scattered around are various type of kamaboko, slices of lotus root and carrot. I think they compliment the rice well. My 9 years old son came home with the unfinish lettuce. That makes me a beaming Mom! As always, I love the Wilton’s silicon cup. This time, I tried to come up with a garden theme. Love how the silicon cup compliment the cupcake so well. The bee is made from fondant and the rest is royal icing. So I decided to have the strawberries cut like a tulip. And again, the food pick came in handy. Far back is the bento for my little boy. No bee for him as I’m afraid that will look not too manly for him and instead of using the flower silicon cup, I used the teddy bear silicon cup. p/s: This is a back dated bento wayyyyyyyyyy back before the Lunar New Year. Busy writing credit report for the big bosses. Left to right – Angel hair spagetti & prawn, sausage & cheddar cheese, baby mandarin orange. In Cantonese Prawn is called ‘har’ which is also ‘siew har har’, that is lots of laugh. So if you want a happy new year ahead, cook lots of prawn and make sure you eat them too! Since I have quite a collection of girly food picks, I decided to get something more boyish for my boy. Love this sword foodpicks very much!